Hi everybody, just a quick note to let you know that I am alive and well. 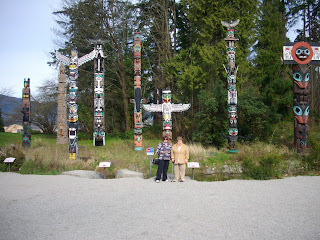 is a picture of the totem poles in Stanley Park. The last time I was there was about twenty years ago. We talked about being there with my Dad and our Mom. Just such wonderful memories! Here is one of the pics I took while out on one of our walks. The colors are beautiful....The marigold trees are all blooming as well. I did not get any pictures though...no batteries...ahhh. 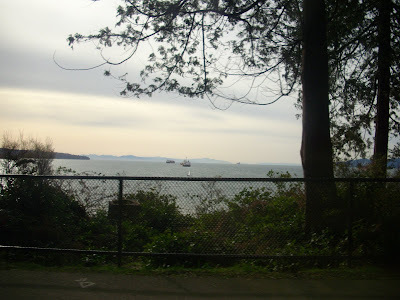 Here is a view from one of the benches on the sea wall in Vancouver. I am so so lucky that my sisters and niece have taken such good care of me. without them I would not have been able to get around. I am excited about seeing my husband this week and then we are off to see my Mom for three days....By then hopefully Spring will have sprung in Alberta and I will b able to enjoy my yard. I have missd you alll so much.. I knew I would, I really feel like I haone forever, so I can hardly wait until I get back home and will pay you all an overdue visit. Until then take care and embrace every day. I am so glad that you are having a good time!! Even when panic threatened to overwhelm you, you soldiered on. I am proud of you!! 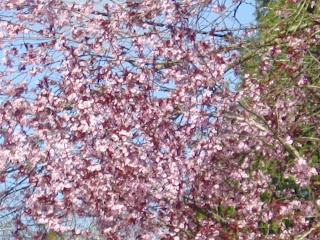 May spring bless you when you return home! other than the panic attack....what a wonderful time ! So happy you are having fun with your sisters and those memories are wonderful. We miss you but are so pleased you are having a good time. I've been a little absent myself and have missed you. Got a moment so I stopped by. Sounds like a good time with your sister. I was just thinking about you and then I remembered your trip and Then.......I saw this post!! Glad you are having a wonderful time!! So happy you managed to push through your fear :) I hear gravol helps with that. It calms the nerves a bit. 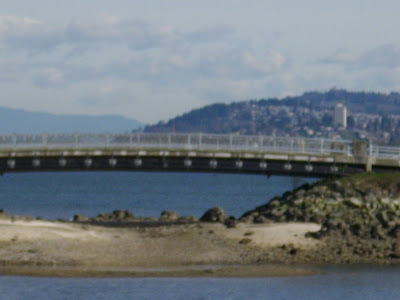 Have fun with the wedding plans ~ Fall is wonderful in BC for the big day. Enjoy your time out West. so glad you are well, my friend.